Bet365 is a household name when it comes to sports betting. Unless you’ve been living in a cave somewhere for the last 40 years you’ll probably have heard of Bet365. Licensed in 1964, Bet365 has grown to be one of the largest sportsbooks that the world has ever seen. At the moment they operate in over 140 countries with a massive 1.5 million customers from around the world! But how do they vary from the competition? Why have so many people chosen Bet365 as their preferred place to bet on sports? Well starting out online in 1998, Bet365 now has an amazing variety of sports and live events that you can wager on. It also has over 40,000 live events every year, which they stream directly to your computer so you can watch all the action while you bet on it! It’s features like this and more such as the handy ‘one wallet’ policy that means your account can be handled in a range of different currencies and funds can be transferred between your Bet365 Sports, Casino and Bingo accounts. Keep reading on to see the full range of features that Bet365 offers to its customers. Bet365 gives you access to over 42 different sports and events. We’re seriously impressed with the vast range of things that you can bet on. As well as the normal sports that people regularly bet on like Football, Rugby, and Cricket, there is a massive list of other more obscure sports such as Handball and Ski Jumping. We’re pretty certain if you want to bet on it then you’ll be able to with Bet365. Take a closer look at what betting opportunities they offer: American Football, Baseball, Basketball, Boxing, UFC, Cricket, Darts, Golf, Cycling, Horse Racing, Greyhounds, Trotting, Ice Hockey, Motor Sports, Pool, Rugby League, Aussie Rules, Rugby Union, Snooker, Soccer, Speedway, Tennis, Volleyball, Winter Sports, Badminton, Squash, Table Tennis, and much more. Whether you prefer betting on major or minor sports, you will find plenty of live ‘in play’ betting options at Bet365. Their sportsbook has a lovely layout where finding everything is so easy. There is a section right at the top that shows all sports and events that are live right now. You can see how long the event has been running, the score and of course the odds. It’s awesome to have a list that is constantly updated as it means you’ll never be waiting for an event to bet on. As soon as you load up the site you are met with hundreds of ways to bet on a range of live sports action every day of the week! This has got to be one of Bet365’s best features. You have the ability to watch over 40,000 live events straight from your computer via the Bet365 website. So if your preferred sports TV channel doesn’t broadcast a certain game you want to bet on, you might be able to watch the game on Bet365’s Live Streaming. We’re quite impressed with the range of top quality live sports, many of which you’d need an expensive satellite dish to watch elsewhere. 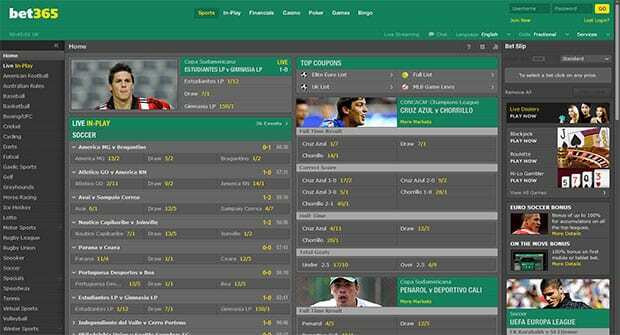 From International Football to Table Tennis, Bet 365 has got it covered. Live streaming at Bet365 is one of those things that once you’ve experienced it you can’t go back. Bet 365 makes it so easy to bet and watch at the same time. There’s also the very useful feature that lets you quickly search past events and check scores. Bet365 offers its users a number of easy ways to deposit and withdraw. Most deposit methods have a minimum deposit amount of £5 and a maximum of £20,000. Most people should find that to be more then enough! The following methods can be used for depositing and withdrawing: Visa, Credit & Debit Cards, Neteller, Skrill (Moneybookers), Paypal, InstaDebit, Click2Pay, Ukash, Paysafecard, Entropay, Bank Wire, Fast Bank Transfer, and Cheque. Like every good online sportsbook, Bet365 offers a number of promotions and bonuses for its customers. These are changing frequently but we update this page very frequently so check back often! Depending on how much you bet you can get up to 50% extra on any winnings with the Parlay Bonus. Place more than 2 pre-game parlays and you’ll get 5% extra all the way up to 50% if you place more than 12 pre-game parlays. Pretty much every online gambling establishment offers a first deposit bonus. Let’s take a look at Bet365’s new user deal! You get a 100% bonus deal up to the amount of £200. You must deposit at least £10. To bet your bonus you must bet the amount that you’ve deposited, you also need to wager the amount of your bonus and deposit 3 times before you can make a withdrawal. This bonus is only activated if you want it to be and you don’t have to claim the bonus if you want to be able to withdraw whenever you want. We don’t think this is a bad deal and a lot of other sites will want you to play through your deposit amount a lot more than just 3 times, so we’re happy with this deal. Bet365’s sportsbook has friendly and helpful customer support representatives, which is what you would expect with a leading online betting company. So if you need to contact them with any issues relating to your Bet365 account, you can reach them using their toll free telephone number. Support is available in multiple languages and they can also be contacted via email. We think Bet365 is one of the best online sportsbooks around. It really has everything you’d want; a great selection of sports, the ability to watch live streaming, great customers support, an extremely easy to use website where everything is simple and quick to find. We’re going to keep this short and sweet: Bet365 won’t let you down.